If there’s any significance to anniversaries, then last weekend marked a biggie for me. Because it was 20 years ago that I gave up owning a car: it happened on 28th February 1995. On that day I drove up to Liverpool in my company car. I was there to attend the funeral of a young woman who was not just a colleague but also a friend. After the funeral I drove the car to the garage of the company’s fleet manager, handed in the keys, and left it there. I haven’t owned a car since. Why did I give up the car? The timing of the funeral was accidental in that the lease on the car just happened come to an end at the same time. But there was also a need to do something positive on a sad day. I could have taken the line of least resistance - with my (then) pay package I could have replaced the car with something swish and probably German. But rather than drive out of the garage in a new Beamer, I had done the maths, had a long think and made the choice to give up on owning a car. I went home on the tube....and thus began my carfree life. Of course, ‘carfree’ is a bit of a misnomer. There is no car permanently in our household, but our life is not devoid of cars - for a start, we often use taxis. And sometimes a car is the best way to get from A to B. 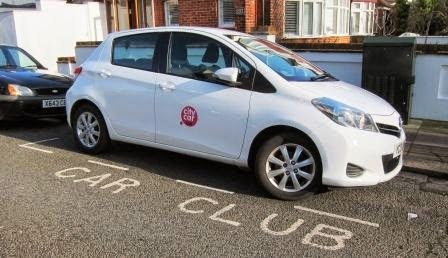 So we sometimes hire a car from City Car Club or, for longer trips, from one of the national car rental chains. Sometimes a car is the only way to go - if you're in Tasmania, there is very little public transport, so a hire car is (or was) the only sensible way to get around. And if you need to go from Los Angeles to San Francisco, with some stop-offs along the way, you can’t really do better than point a convertible up Highway One. But, exceptions like these aside, it’s been twenty years since I had to deal with the hassle and expense of being a car owner. On reflection, what has been most amazing is just how infrequently I find myself thinking, “A car would be really useful today.” It happens occasionally, but mostly, there is more gain than pain - I’m better off, fitter, thinner and more relaxed than I would be if I still had four wheels parked outside. And that’s before even mentioning the environment. In a nutshell, the lesson from my 20 carfree years (apart from, why don’t more people do it?) goes like this: being able to drive is a useful life skill. You never know when it might come in handy. But that doesn’t mean you have to own a car. After all, when you want a pint of milk, you tend not to go out and buy a cow.